There’s a video going viral on Facebook about a photographer that films a bunch of strangers kissing for the first time. It doesn’t impress me much because back in college we called that a Friday night at the bar and if we were lucky that led to a no pants dance with a stranger. So how does this apply to the world of sports? 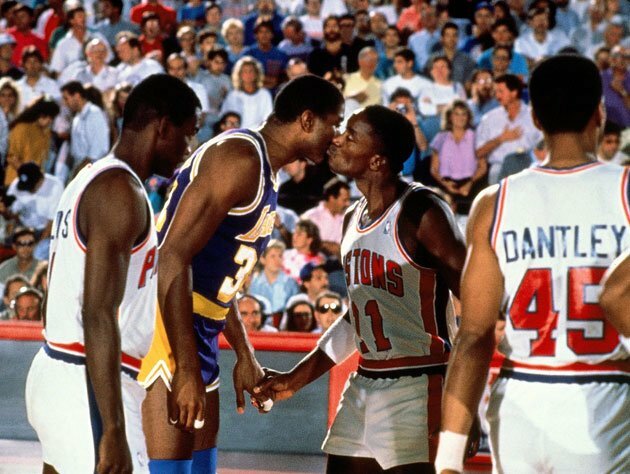 Well back in the day Magic Johnson and Isiah Thomas used to kiss before games. You know, in a total bro kind of way, just like you and your roommates probably did before you went to a party to drink jungle juice out of a garbage can. Oh wait, you didn’t do that? 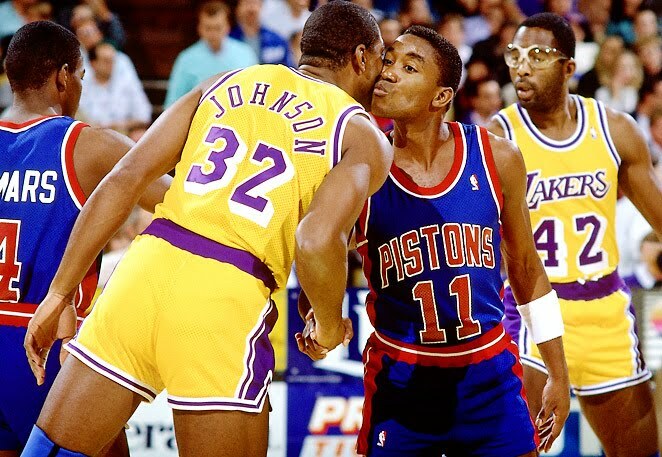 While kissing my friend before a big game wasn’t my thing, it was for Magic and Isiah and who am I to argue. I never filled in for Kareem at center in the NBA Finals and wasn’t left off the Dream Team because Michael Jordan didn’t like me. Let’s look back at the bromance that was Magic and Isiah’s relationship. Imagine if LeBron James and Kevin Durant did this before an NBA Finals game this year. The Internet would break and there would be talking heads everywhere questioning how this will effect locker room chemistry and if it will effect Michael Sam’s draft stock. Also, props to Big Game James for rocking the Kareem rec specs. Isiah Thomas was once on the Jim Rome show and said “sorry I’m late, I was at Red Lobster.” Without fail this makes me laugh every time. It’s like Zeke is telling Magic how he loves the smell of those cheddar cheese biscuits. 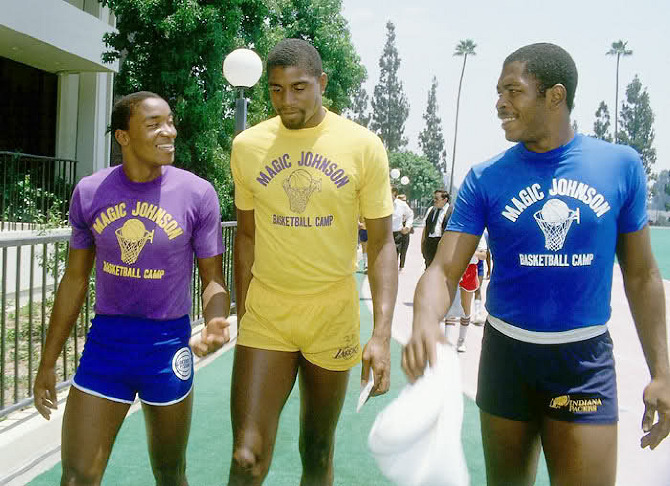 Back in the day OshKosh B’gosh used to make shorts for NBA players. They only came in boys medium. Looks like someone is a fan of the Nature Boy Ric Flair’s stylin’ and profilin’. WOOOO!